Sweet treats for special occasions and everyday from English Country Cooking. Do you call it Pancake Day or Shrove Tuesday? Personally we like pancakes all year round, after all what’s not to like? As a child though I never got them very often and come Shrove Tuesday, they tended to be served up with Golden Syrup or lashings of sugar and some lemon juice. I wasn’t keen on the golden syrup then and there’s no way on earth I could eat it on pancakes now, way too sweet. This entry was posted in Desserts, Recipes, Sweet Treats and tagged Pancakes on February 17, 2015 by Sue Todd. Vanilla Sugar © 2015 Sue Todd. For the great baking nation that it is, England doesn’t make enough of vanilla sugar. I just adore the smell of it and use it all the time for cakes, crumbles, ice cream and deserts. 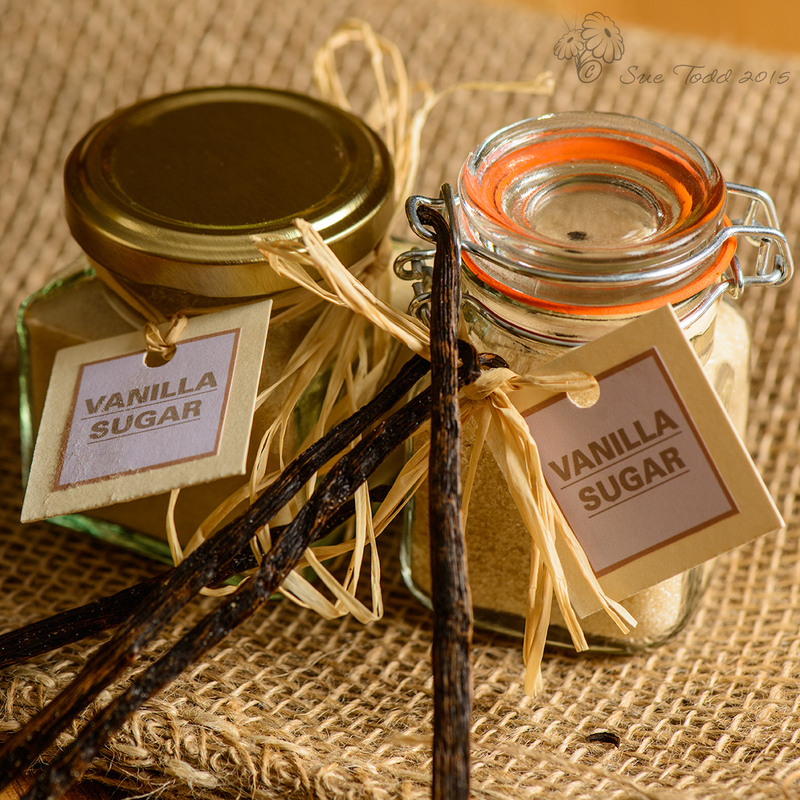 We have a large jar of vanilla sugar in the larder cupboard in our kitchen, which we simply top up as we use it. The smell is just divine, it evokes child hood memories of standing on a chair in the kitchen to help my mum make cake, licking the bowl out afterwards. I remember when our children came along and the joy of baking with them being turned to dismay when I realised I’d have to hand the bowl over to someone else to clean out, even if it was my offspring! Bad mother! This entry was posted in Recipes, Sweet Treats and tagged Vanilla, Vanilla Sugar on February 9, 2015 by Sue Todd. Reading online about drying foods using a fancy dehydrator had got me hankering after a bit of retail therapy, but then I remembered ……. that now we’ve moved I have an AGA that actually works! As opposed to a monstrous hybrid which didn’t. Dried Fruit ahoy! 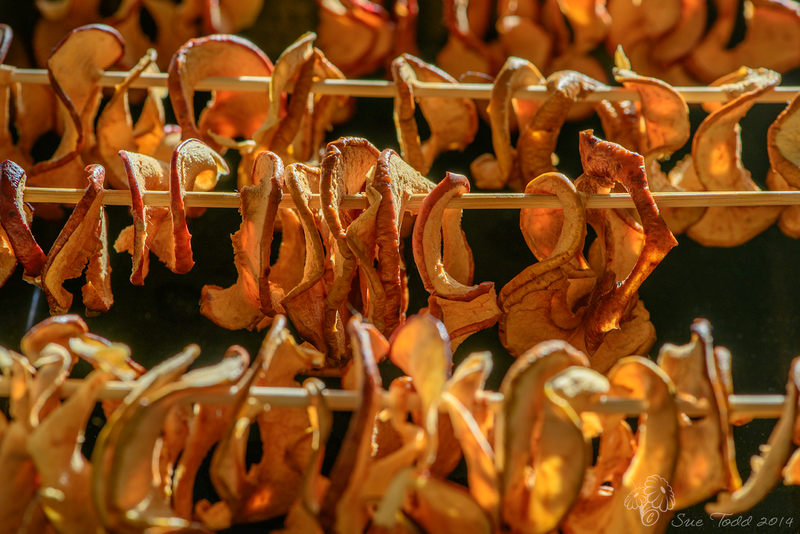 This entry was posted in Recipes, Sweet Treats and tagged Apples, Dried Fruit, Drying Fruit on November 6, 2014 by Sue Todd. 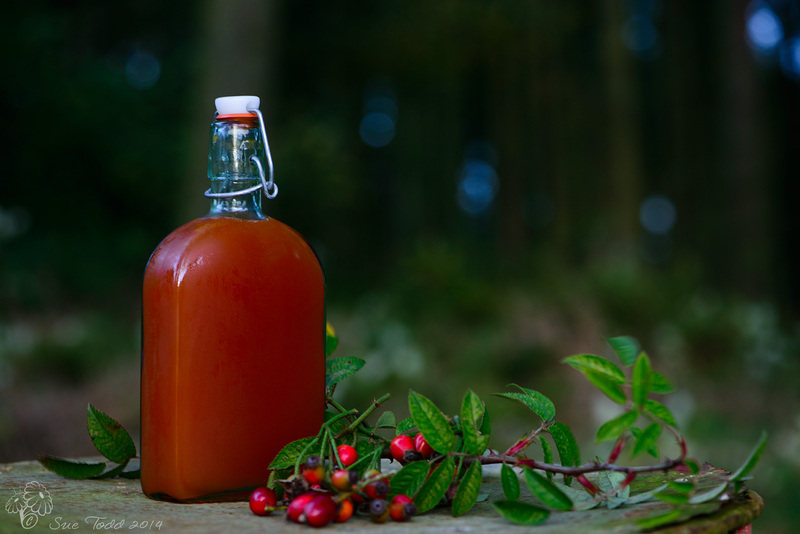 We’ve had great fun making rosehip syrup this year. Actually Gary may argue that he didn’t enjoy the picking process at all, but I assured him that it was a case of ‘no pain, no gain’, before i went off to pick blackberries instead. I’d recommend the use of protective gloves, they really don’t want you to pick them. Since I mentioned it people have asked me over on the English Country Cooking Facebook page what you use it for. That was when I realised how little used and known this gem has become over the years. There’s a list of ways to use Rosehip syrup at the bottom of this post and as we experiment I’ll keep adding to the list. I remember being given it on rice pudding at school; one of few fond school memories I can tell you. 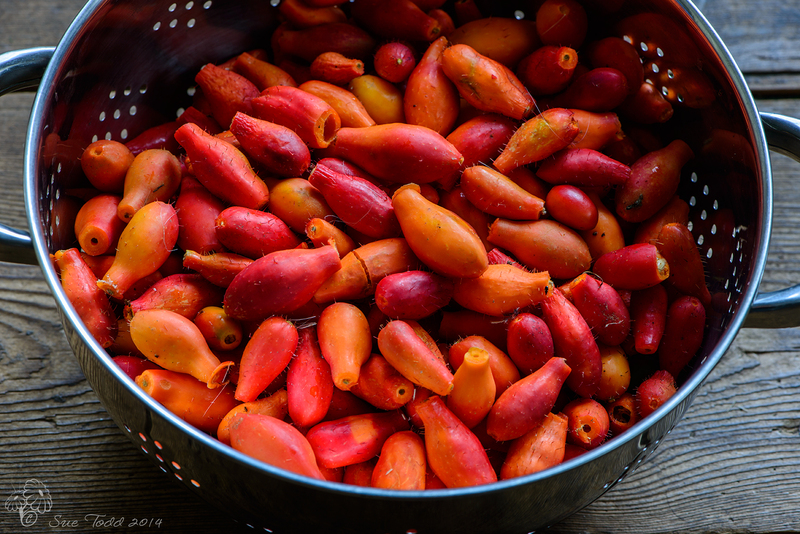 Some background information on Rose hips. Rosehip syrup is extremely rich in Vitamin C, possibly one of the richest plant sources of it, with a reputation for keeping colds at bay. Are you old enough to remember being given a teaspoon of rosehip syrup every day? It was a regular thing in households across England, at one time. It became popular in war-time Britain, when fresh fruit was in short supply, but fell out of favour with protests about what the sweetness was doing to children’s teeth. It is sweet but as long as dummies aren’t being dipped in it, it’s probably less harmful than sweets and its good for you. You can still buy it, I see, having had a quick look on the interwebs. You won’t find it on the shelves at the supermarket though, you’d need to go to a health food store or buy online. But beware because commercially made rosehip syrup is often fortified with lab-made vitamin C because of what is destroyed in the processing. So proof, if it was needed, that home-made has the edge on mass-produced anything, and while it takes a bit of effort, and pain in the picking of them, its well worth it. We’ve just got the one bottle this year, but next year we’ll be making loads of this. You will need a couple of bottles which have vinegar-proof lids or stoppers for this, the fruit acids don’t mix well with metal. Wash them well in hot soapy water, rinse and then sterilise them for use by putting them on a tray in the oven on a low heat to dry out and heat through. I use the simmering oven on the AGA, on a conventional oven you’d be looking at a temperature of around 120C/240F/Gas 1-2. Rosehips, topped and tailed. © Sue Todd 2014. Top and tail the rosehips. Give them a good wash, then put them into a food processor or blender and blitz. This is best done in batches. Alternatively you could mince them. Put the resulting mush into a large stainless steel saucepan and add the water. Bring the water to boiling point, then turn the heat down (on the AGA switch to the left hand plate) and allow the rosehips to simmer for about 15 minutes. For the next step you’ll need either a double layer of muslin or we used a jelly bag for straining the pulp. You need to support this over a large bowl in order to strain the liquid. The idea is to catch all the irritant hairs, which believe me you really don’t want in there. We used an upturned stool to support the jelly bag over a large bowl, very Heath Robinson, but it worked a treat. Rosehips Cooking. © Sue Todd 2014. 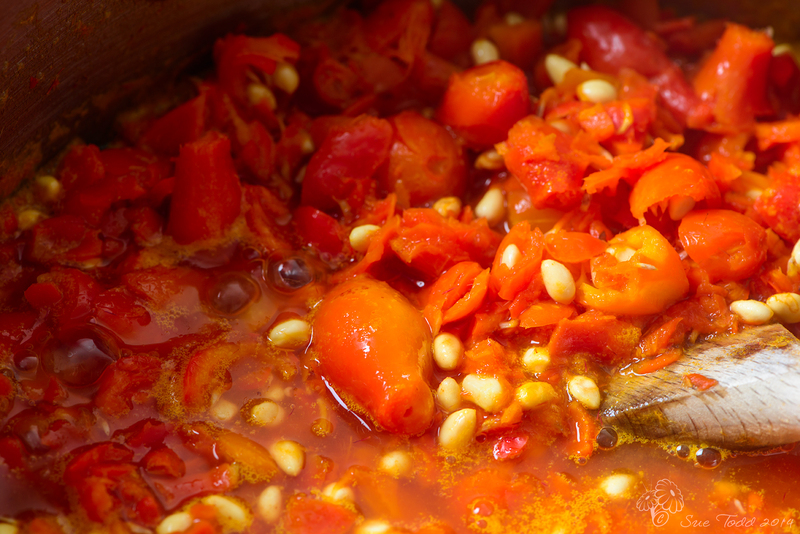 Let the mushy pulp drain for a good while, at least half an hour, to get as much rose hip juice as possible. Tip the mush out into your compost bin before washing the muslin or jelly bag out and repeating the straining process one more time. Next you need to carefully measure the juice with a measuring jug into a large saucepan. For every 500ml of liquid you have, you need to add 325g sugar. Put the pan on a low heat and stir until the sugar has completely dissolved. Now bring it to the boil and boil for 3 minutes. If any scum forms, skim it off with a slatted spoon. Take your, now sterilised, bottles from the oven and decant the syrup into the bottles and seal immediately. When the bottle have cooled you can label them. Your rosehip syrup is now made and ready for use. You’ll need to use it up within four months, so it is a good idea to make a note of the date on the labels, and once it’s opened do be sure to keep it in fridge. 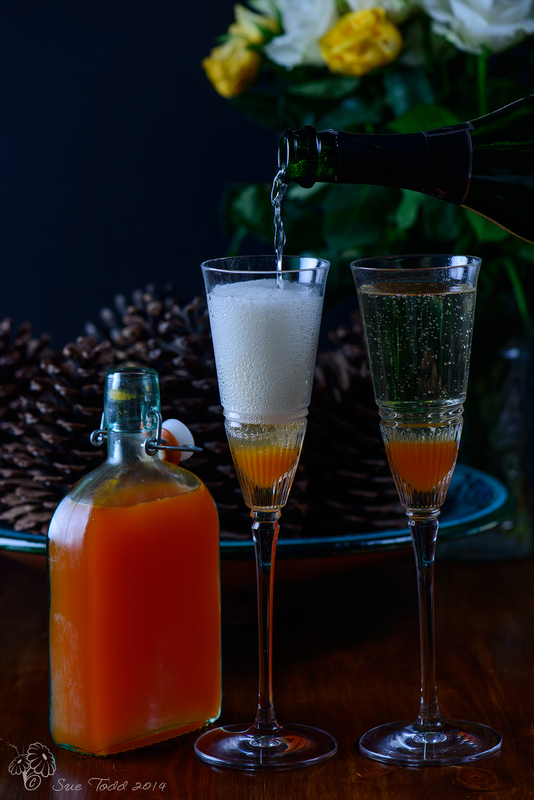 Rose Hip Syrup and Champagne Cocktail. © Sue Todd 2014. And if you can’t use if all up in four weeks of opening, pour into an ice cube tray and freeze – then its easy to take out and use. Actually, the more I think about it, adding rose hip ice cubes to glasses of champagne or wine sounds like a really nice idea! This entry was posted in Recipes, Sweet Treats and tagged Rosehip Syrup, Rosehip Syrup Cocktail, Rosehips on November 3, 2014 by Sue Todd. 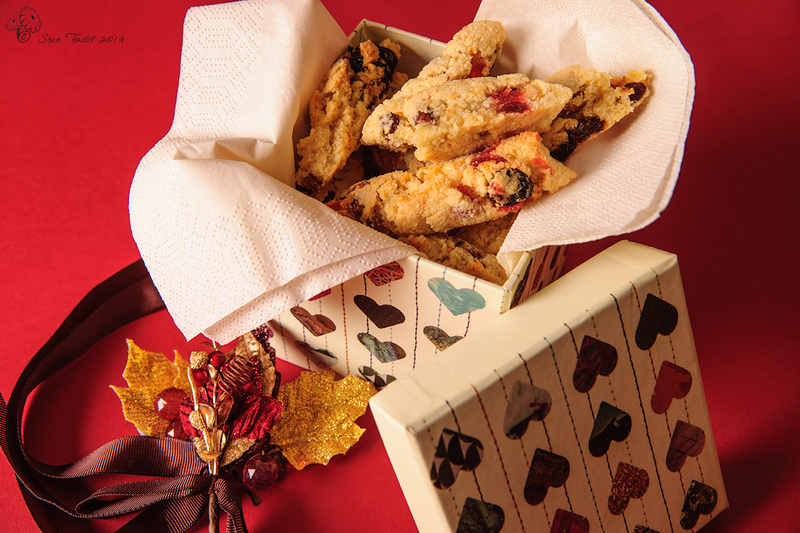 Biscotti Biscuits, gluten-free, wheat-free, lovely home-made gift idea for Christmas. © Sue Todd 2014. I love biscotti biscuits, they are great with coffee or ice-cream and this is a lovely time of year in late autumn to make them and experiment with them ready for Christmas. While I have a number of recipes about for these, none of them were gluten and wheat free and that was what I was after. So it was time to experiment, I had a ‘how hard can it be?’ moment, and luckily I think they worked well, they’ve certainly disappeared quickly. This grain-free version is a little softer than biscotti normally are, but then my teeth were quite thankful for that. I’ve followed a few different biscotti recipes in the past and some like to use mixed spice but I tend to avoid this as I’m allergic to cinnamon. I’ve also found that you can quite safely mix and match the fruit and nuts according to what you have in the cupboard. I rarely have the exact ingredients needed and so have gotten used to swapping ingredients out. These biscotti seemed to go down very well and I’ll definitely be making them again. Not only are these great for serving with ice cream or coffee, they also make great presents wrapped up in cellophane or presented in pretty boxes. Sesame flour for flouring a board. If you are using a conventional oven, preheat it to 180C/350F/gas4. Line 2 baking sheets or one AGA cold tray with greaseproof paper. This is great as you don’t have to grease the trays at all and I always find that rather tedious. Put the flours, baking powder and sugar in a large bowl and mix well before adding the orange zest and eggs. Mix now until the mixture begins to come together in lumps. At this point it gets messy as you really need your hands in there to start pulling it all together. It may feel that it can’t possibly come together and you may be tempted to add some liquid – DON”T! Just keep kneading and it will come together, it just sometimes takes a while. Once there are no floury patches left, add the fruit and nuts and mix well so that the fruit and nuts are distributed evenly through the mixture. This mixture is and remains quite sticky. Turn it out now onto a floured board, you could use more almond or coconut flour but I chose to use a little bit of sesame flour, adding a little more structure to the mix and making it a little less sweet. Not having a hugely sweet tooth, this was, for me, a good move. Anyway once the mixture is on your floured board, divide it into four equal portions. Roll each portion out with your hands into a sausage shape about 30cm long. Place 2 on each of the smaller trays or you’ll find all four will sit on one large AGA cold tray. I use these for baking all the time and just love how much you can get on them in one go. Remove the trays from the oven once the dough is ready and transfer the four biscotti portions to a cooling rack to cool – this can be done quickly and easily by lifting the parchment off the tray and onto the cooling rack, thought you need to do it gently. Leave them to cool for a few minutes until the are cool enough to touch. At this point if you are using a conventional oven turn it down to 140C/275F/Gas 1. I’ve not tried those settings, these are gleaned from other’s biscotti recipes. I keep going with the baking oven of the AGA for mine. Once the portions have cooled, you need to take a bread knife and carefully cut the portions into 1cm diagonal slices. You need to be quite gentle in doing this as the mixture is more delicate than normal biscotti, and it crumbles into pieces easily otherwise. Lay the slices flat out onto the baking trays. I just re-used the same parchment paper. It can become a bit of an artform trying to fit them all on but they generally fit. Bake them for a about a further 15 minutes now, I think mine took a little while longer. You want them to be dry and golden in colour at this point. Having a memory like a sieve these days I tend to set a timer, otherwise I can find my hard work has been turned to charcoal in the AGA – there’s no smell until you open the oven door! Once baked sufficiently, remove from the oven and transfer to a wire rack to cool. 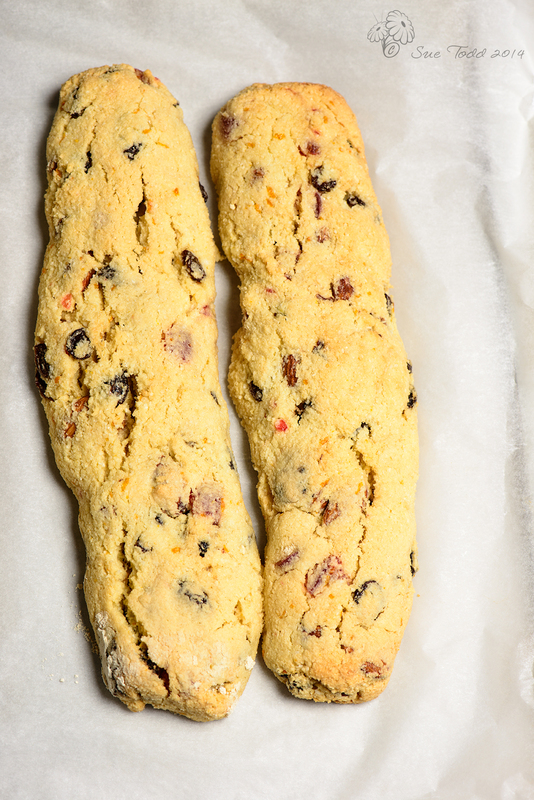 Because these are not made with wheat flour and don’t have anything added to help hold them together they are prone to be rather more delicate and crumbly than conventional biscotti, so you’ll need to handle them carefully. Again I found it far faster and easier to carefully tug the greaseproof paper off the AGA tray and onto the cooking rack so that they all moved in one fell swoop. Leave them to cool and then pack away in an airtight container. They should keep for a week or two quite happily. Again biscotti made with wheat flour will, I know, keep for about a month, but these ones haven’t hung around that long so I can’t state the same for these as yet. 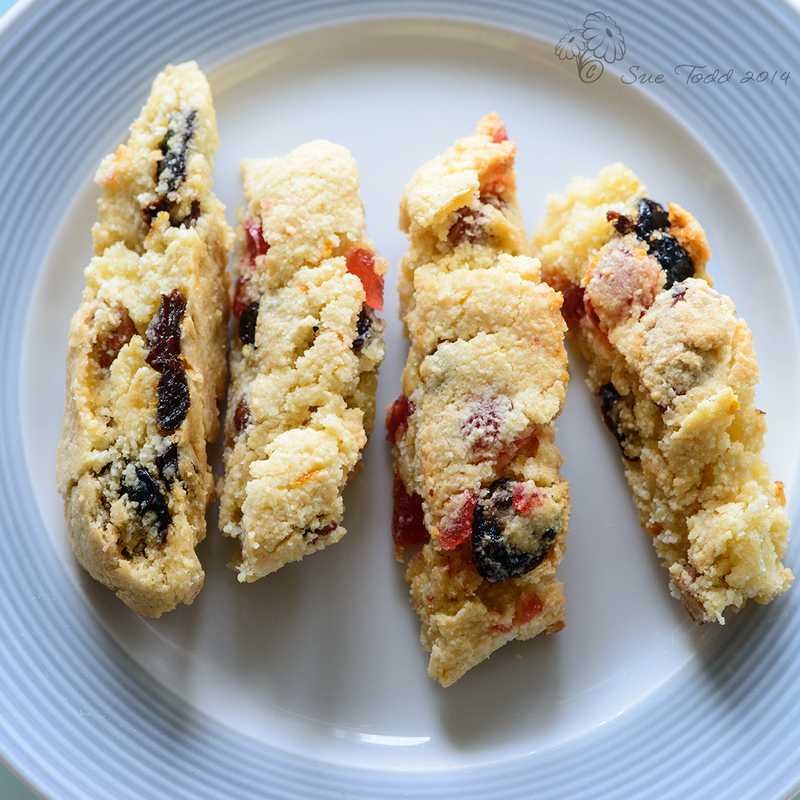 Gluten free, Wheat free, Fruity Biscotti Biscuits. © Sue Todd 2014. Vary the fruit and nuts used, I think dried cranberries would work quite well and be very seasonal. Also try lemon instead of orange. If you want a christmassy version you could add 2 teaspoons of mixed spice or cinnamon. Also most people use blanched almonds, I just throw ordinary ones in to mine. They all eat just the same. This entry was posted in Recipes, Sweet Treats and tagged Biscotti, Biscuits, Christmas, Gluten Free, Grain Free, Wheat free on November 1, 2014 by Sue Todd. 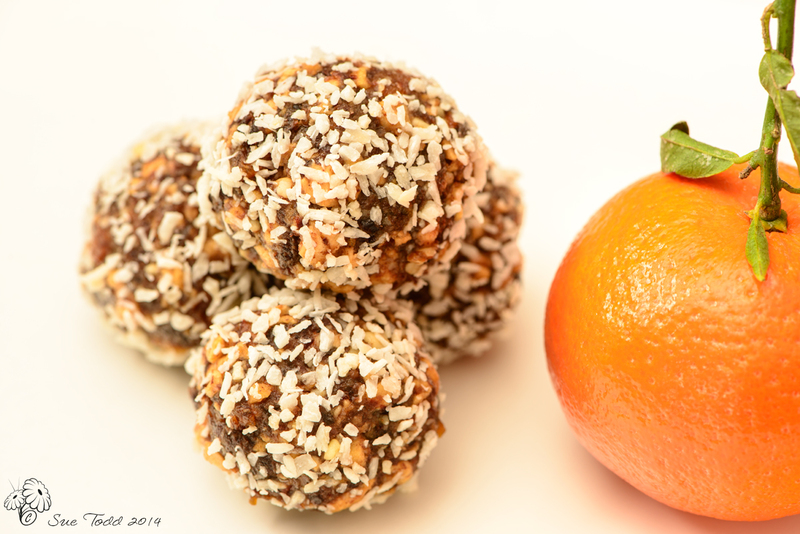 These are really easy to make, have no added sugar whatsoever and taste fantastic. Wholesome, good for you and delicious, what more can you ask. The other wonderful thing about this recipe is that you can just swap ingredients out depending on what you have, for instance while I’ve used cherries, apricots, apple and pecans, you could just as easily use dates or any other dried fruit and walnuts, hazelnuts or almonds, just make sure you have the same quantities of dried fruits or nuts and it works. If you want to omit nuts for nut allergy just replace the nuts with the same quantity of extra dried fruit, and use more coconut oil in place of the peanut butter. This would be good to make with children but do be careful with the food processing though. They’d also make a nice gift. Put your chosen dried fruits/nuts into a food processor and pulse until finely chopped. You don’t want a purée, but you do want it to be slightly on the sticky side. Tip the chopped fruits and nuts into a bowl, add the peanut butter and coconut oil and mix with a spoon or your hands. Children will enjoy mixing this up with their hands. Shape the mix into small balls. The number you will get will depend on the size you go for. With my first batch I only got about 8, which didn’t seem many but they were larger than the average walnut. With the next batch I got a good deal more. 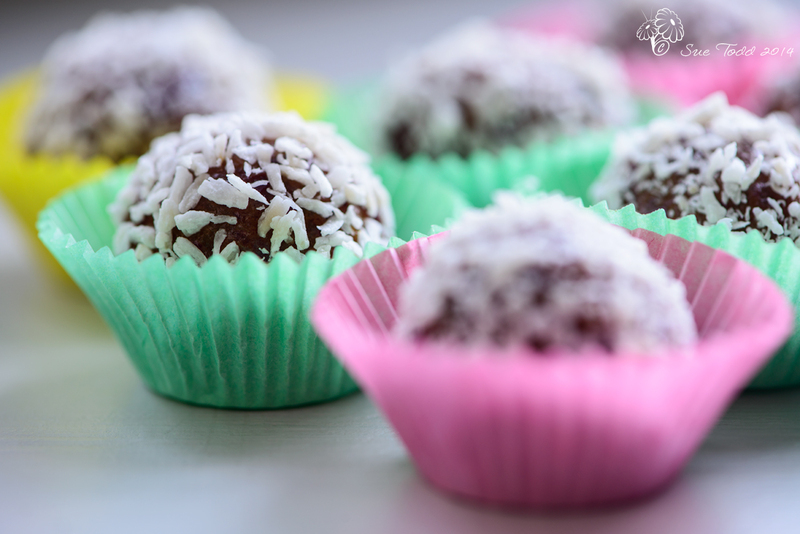 Then roll your treats in the coconut to coat them. Store in an airtight container, if you can keep them! And that’s the challenge, they are wonderfully moreish. You could use sesame seeds instead of the coconut to coat these. Pumpkin seeds and sunflower seeds could replace the nuts. This entry was posted in Recipes, Sweet Treats and tagged Dried Fruit, Gluten Free, Grain Free, Sugar Free, Sweet Treats on September 22, 2014 by Sue Todd. 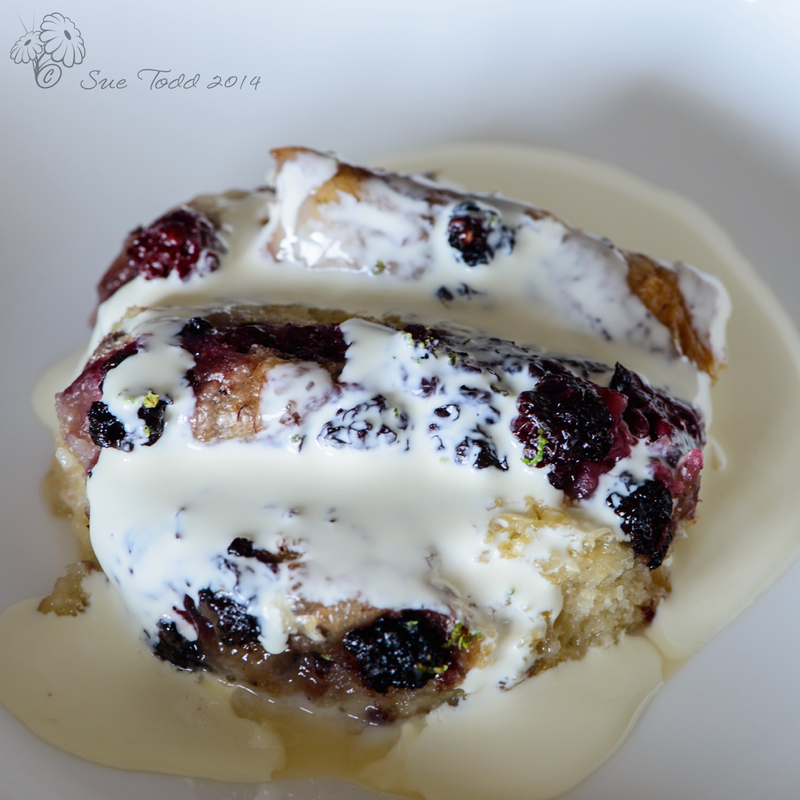 Blackberry Focaccia Bread and Butter Pudding. What can I say? It had to happen. There was left over blackberry focaccia which it would have been criminal to waste and I had the ‘4 o’clock’ munchies coming over me, so I persuaded Gary to make me some bread and butter pudding with the left overs. I’ve actually just polished off the final bit of that for breakfast! Servings: ? That will depend on how much left over blackberry focaccia you have and how much of a portion you manage to limit yourself too. I think we got about 8 servings from ours, though I may have had rather more of those 8 servings than anyone else! 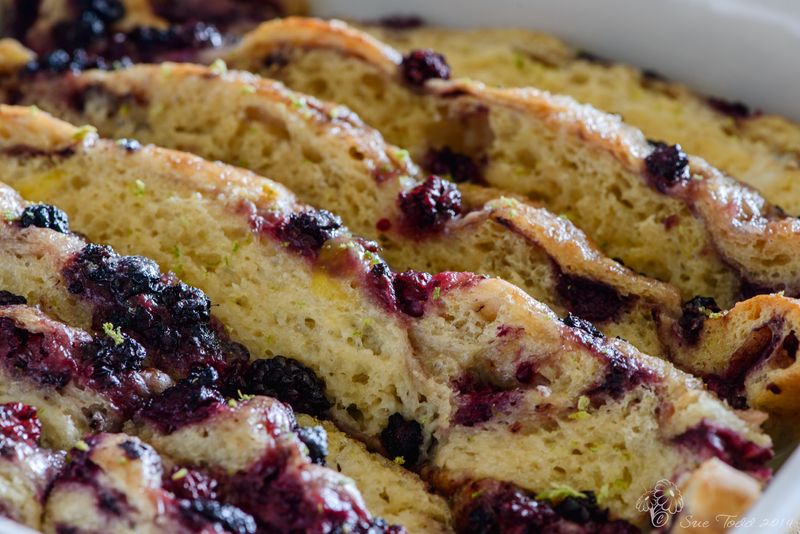 Slice the left over blackberry focaccia and butter generously, ideally with unsalted butter. Lay in a flat, well buttered square dish overlapping each slice, butter side up. or caster sugar and a splash of Vanilla Extract to the milk and eggs, whisking it together well. 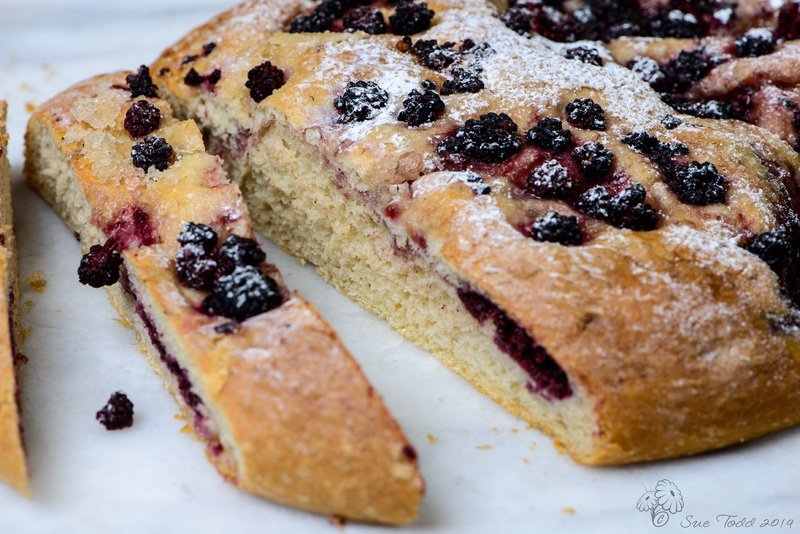 Pour over the top of the blackberry focaccia and place in the baking oven of the Aga until its golden and yummy, about 30-40 mins. Serve warm with cream. This entry was posted in Recipes, Sweet Treats and tagged Blackberries, Dessert, Focaccia, Pudding on September 13, 2014 by Sue Todd. Having finally gotten some sort of harvest in an abundance of blackberries (thanks to the assorted wildlife who’ve eaten our garden), I wanted to do more than just the same old fruit crumble, not that there is anything wrong with fruit crumble. So it was off to the web and off to my collection of cookery books and magazines. Gary bought me Nigel Slater’s Tender volumes 1 and 11 for Christmas a couple of years back and it was there I found Nigel’s recipe for Blackberry Focaccia. What a revelation! Having said that I ought to have paid more attention to the number of servings – it serves 8 and there’s just the two of us! Whoops. I’d like to add though that not a morsel was wasted. Nigel thinks it is more suitable for tea than dessert, but we had some for dessert and it was delightful, and although he says it should be eaten while warm and doesn’t keep, we had some with coffee next day and it was still lovely. I think it would be fabulous picnic food too. We used what was left to make a bread and butter pudding – and that was delicious. I always use my Kitchen Aid for bread making these days, it merrily kneads while I clear up and since I use the bowl to raise the bread, the only extra washing up is the dough hook. It’s a ‘win-win’ kind of thing. Simply put the salt, flour and yeast into the bowl, add the sugar and then as you start to mix it up add the water slowly. You can either use a food mixer or combine the ingredients with a spoon before turning it out on a floured surface to knead lightly for about five minutes. I just left the Kitchen Aid to get on with the kneading while I put stuff away. Once done, it needs to go into an oiled bowl (Nigel says floured, but I always use a bit of olive oil or butter round the bowl) to rise. I simply grab the dough in one hand from the mixing bowl, slosh a bit of oil into the bowl with the other hand and pop the dough back in, covering with a clean cloth and put it in a warm place to rise. It should take about an hour, but it will depend on the temperature really. I popped mine on the AGA and it didn’t take that long. Once it has doubled in size its time to knock it back. You then need to combine half of the blackberries into the dough. This wasn’t as messy or as tricky as I’d envisaged. Nigel recommends a shallow tray, but I always use an AGA cold tray for bread so that’s where it went. 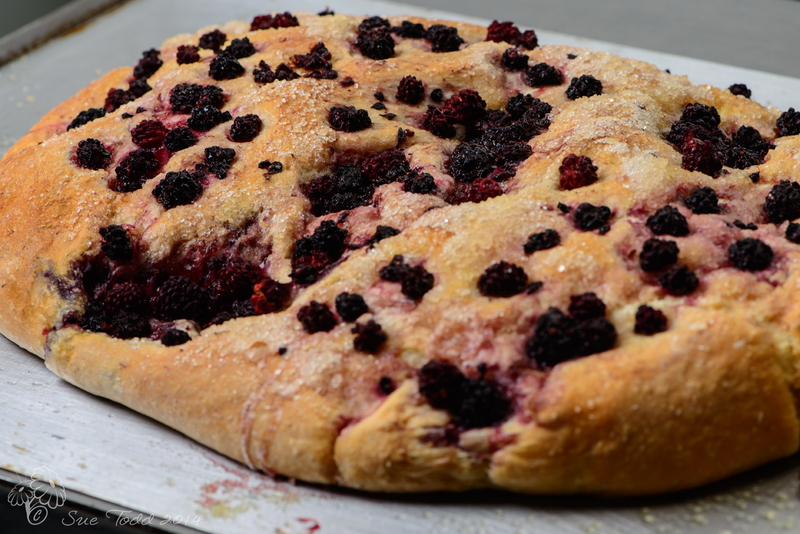 Now scatter the rest of the blackberries over the top of the dough and press them in gently. Cover the dough and leave to rise for the second time. Nigel states you need an oven temperature of 220C or Gas 7 if you have a conventional cooker, and you’ll want to preheat it. I use the baking oven in the AGA. Once your loaf has doubled in size again, its time to drizzle the olive oil over the top and then scatter your castor sugar before it goes in the oven. Mine took a bit longer than the 45 minutes, but I did have to add a cold shelf above it to prevent it burning and give it time to cook to the centre. Next time I think I’ll either make half the quantity as there’s just the two of us or if I’m making the full amount I’d cut the dough into two separate loaves after the first rising to make sure it cooks evenly. It should be golden brown, crisp but still springy to touch when its done. Let it cool before dusting with the icing sugar and then its ready to serve. Enjoy! This entry was posted in Breads, Recipes, Sweet Treats and tagged Blackberries, Bread, Focaccia on September 13, 2014 by Sue Todd. When we moved this summer I was overjoyed to find we had two flower beds just outside the front of the house stuffed with lavender. This of course meant I felt obliged to put said lavender to good use and so I began to comb the internet looking for ideas. Among the things I found was this gem from Hemsley Hemsley (they have some other fantastic recipes that are worth trying out too) for Lavender and maple coconut macaroons. 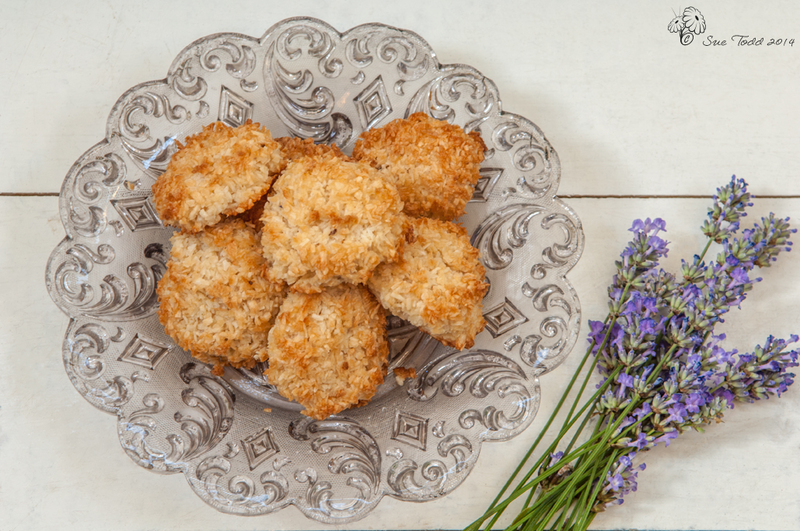 I really love coconut macaroons and the thought of adding lavender to them was intriguing. I have to say it really works, but a word of warning, they are terribly moreish! If you avoiding wheat/gluten then they make an ideal sweet treat. Because this just wants the whites from the eggs I timed my baking for when I was also making ice-cream and the yolks went into the ice-cream. If you are using a conventional oven then you’ll need to preheat it before you begin to 170°C/330°F/gas mark 3½. If like me you are using an AGA, they want to go in the baking oven. Prep a baking sheet at the outset by lining it with greaseproof paper. Chop the lavender finely – I used a herb chopper, then add your lavender to a large mixing bowl with the maple syrup, vanilla extract and the coconut and mix it well. Put it to one side while you prepare the egg whites. Put the egg whites in a clean bowl and whisk with a pinch of salt until they form stiff peaks. You can do this by hand but I prefer to use an electric hand mixer for ease. Gently fold your egg whites into the lavender and coconut mixture using a metal spoon to pull it altogether gently. Now, scoop little heaps of the mixture out onto the baking tray you prepared earlier. You might have to stir the mixture a little as you go to prevent it from separating out. If you want to be precise you could use a tablespoon measure for the scoops and you should then get about 18 macaroons. I just went for dollops of mixture and so got rather less. Pop into the oven for somewhere between 12 and 15 minutes until they are lightly browned. With the AGA because there are no smells from the oven into the kitchen I find it very easy to forget there’s anything in there, so I always try to remember to set a time. A little kitchen timer has saved me from having to take the charred remains straight outside on more than one occasion. I think these are rather lovely as they are, but I fancy trying them with one half dipped in chocolate or a chocolate coating on the base too. This entry was posted in Sweet Treats on August 29, 2014 by Sue Todd.